Talks aimed at establishing a new Northern Ireland Executive have made no progress so far, Sinn Féin has said. “We have seen no progress to date,” said the party’s Stormont leader Michelle O’Neill. The parties missed a recent deadline to form a power-sharing executive after a snap assembly election last month. The two biggest parties, the Democratic Unionist Party (DUP) and Sinn Féin, blamed each other for the failure of those talks. DUP leader Arlene Foster said Sinn Féin was “not in agreement-finding mode”, while Mrs O’Neill said the DUP did not have “the right attitude”. Northern Ireland Secretary James Brokenshire has given the parties until 18 April, when the House of Commons returns after the Easter recess, to reach a deal. The political deadlock came after the election on 2 March brought an end to the unionist majority at Stormont and the DUP’s lead over Sinn Féin was cut from 10 seats to one. Under Northern Ireland’s power-sharing agreement, the executive must be jointly run by unionists and nationalists, with the largest party putting forward a candidate for first minister. Mrs Foster said on Monday that there had been “constructive engagement” during roundtable talks between party leaders. Asked if an agreement was possible, the former first minister replied: “As far as we are concerned, yes, absolutely”. 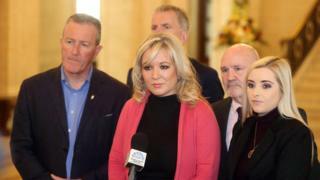 But in Stormont’s Great Hall on Wednesday, Mrs O’Neill said dealing with the legacy of Northern Ireland’s Troubles remained a major stumbling block for Sinn Féin. “The key issue in relation to the British government is the issue of legacy,” she told reporters. “Families shouldn’t have to come up to the steps of Stormont to campaign for access to inquests 47 years after, for example the Ballymurphy (killings),” she said. Mr Brokenshire has said he still believes there is a short window of opportunity to find agreement, with no appetite for another snap election. Last month’s poll followed the resignation in January of Sinn Féin’s Martin McGuinness as deputy first minister, in protest against the DUP’s handling of a botched green energy scheme. The party said it would not share power with Mrs Foster as first minister until the conclusion of a public inquiry into the Renewable Heat Incentive (RHI) scheme. Mr McGuinness, who had been suffering from a rare heart condition, died last month at the age of 66.